This object is a biomimetic representation of the natural process of bone formation. Hog gut is manipulated using textile structures to create a tissue matrix. The matrix form was then suspended in a saturated solution of disodium tetraborate (Borax) to grow crystals. This mimics a fantastical imagining of the natural biological process of the growth of hydroxyapatite crystals on a collagen tissue matrix in the development of living bone. 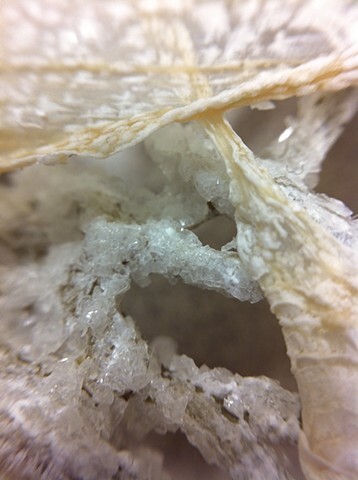 Following crystal formation, more hog gut is overlaid to create the impression of bone surface, still partially revealing the inside structure to create a nonliving artifact.